Dandruff is a common affliction that many people suffer from, and there are many causes for the flaky and itchy skin that bothers many a scalp on a daily basis. While many people choose to use traditional methods of treating their dandruff by using specialty shampoos and tar-based remedies, these expensive cures often don’t have long-term benefits, and don’t quell the underlying causes of dandruff in the first place. Discovering apple cider vinegar, also known as ACV, can help you learn how to manage your dandruff symptoms and problems without putting costly chemicals on your scalp. Learning just how an apple cider vinegar cure for dandruff works, you can feel more confident in your scalp, skin, and healthy hair in general. In order to treat dandruff successfully, you should know what is causing your issue in the first place. If your dandruff is accompanied by bleeding, severe itching, or an odor, then your dandruff is most likely caused by too much oil being produced on the scalp, which can lead to bacteria buildup. This in turn leads to irritated skin that is flaky, dry, and very itchy. Dandruff that is severe in nature is normally caused by a yeast-like fungus that is ever-present in every person’s scalp, but exists in abundance in certain individuals and you may be one of them. Allergies, stress, and other factors can make this fungus, known medically as Pityrosporum ovale, to flare up and cause the scaling, itchiness, and embarrassing skin sloughing that dandruff is so known for. Contrary to popular belief, dandruff is not caused by over-shampooing the hair or not drinking enough water, so wash away. Rather, dandruff is caused by separate imbalances in the skin that must be treated in order to make the dandruff stop. Using apple cider vinegar for dandruff can help you manage both your symptoms and the cause of this condition so you can lead a more normal lifestyle. Apple cider vinegar has been used for centuries for a variety of uses, from preserving foods to treating many medical maladies. Since ACV is a great anti-inflammatory and anti-bacterial aid, it’s a perfect tool for not only treating the agony associated with dandruff, but in treating the excess bacteria and yeast-like fungus that make dandruff reoccur as well. Since apple cider vinegar doesn’t contain harsh chemicals and specifically targets the cause of dandruff, many victims of dandruff find quick and effective relief using ACV in their daily hygiene. As you use an apple cider vinegar cure for dandruff, you can see positive results within a few days to a week of use, depending on how severe your symptoms are and how you are using ACV to treat your itchy scalp. For the best results, you¬ should use an undiluted version of apple cider vinegar and avoid using non-organic varieties. Apple cider vinegar can be used alone to treat dandruff, or can be used with other natural and traditional remedies to fully treat dandruff the most effectively. How apple cider vinegar for dandruff should be administered depends on the individual using it and how severe their dandruff symptoms are. For mild dandruff, a weekly rinse of equal parts cool water and apple cider vinegar massaged into the scalp should help manage the overly oily skin and keep nasty bacteria and skin flaking at bay. Moderate dandruff, or dandruff that occurs a few times a week or more, can be treated by applying a cup of apple cider vinegar to your daily shampoo and mixing the concoction together for daily use. This way, you are always using the best defense against dandruff and the side effects that come along with it. For severe symptoms, there is another way to use an apple cider vinegar cure for dandruff. Apple cider vinegar can be massaged directly into the scalp every other day for a week until symptoms subside to help treat the fungus that makes the skin flare up and scale. You should pay attention, however, to possible side effects of this method, which includes dry hair and burning of the scalp if open sores are present. For sensitive scalps, apple cider vinegar should be slightly diluted with water to lessen its impact on the scalp, or used with a shampoo that contains selenium to best combat stubborn dandruff. In addition to applying a direct ACV rinse of the hair, people who suffer from severe dandruff can combine other natural remedies with their apple cider vinegar for optimum results and quick relief. Tea tree oil works much like apple cider vinegar does, and helps to reduce or even eliminate the bacteria and fungus that makes dandruff so severe. A few drops of tea tree oil mixed with apple cider vinegar either in shampoo, water, or applied directly on the scalp can help reduce symptoms even more quickly and get dandruff under control. Honey is another remedy that you can use in addition to apple cider vinegar for dandruff. Honey has a soothing effect on the scalp and also contains anti-bacterial and anti-inflammatory properties, making it the perfect addition to an AVC scalp treatment for you if you are experiencing painful scalp issues or very itchy skin. Honey can help treat the burning and itching while treating the initial problem of the dandruff at the same time, allowing the apple cider vinegar to do its job without causing more discomfort to your scalp while using it. For best results, make sure you are using a natural anti-dandruff shampoo that is free of harsh chemicals in addition to using ACV if you have severe dandruff symptoms. This way, especially if you use organic shampoos, you can know that you are using the best defense possible against nasty dandruff and the irritating symptoms that come along with it. Apple cider vinegar for dandruff is a great way to help manage dandruff symptoms and problems without using harsh chemicals. 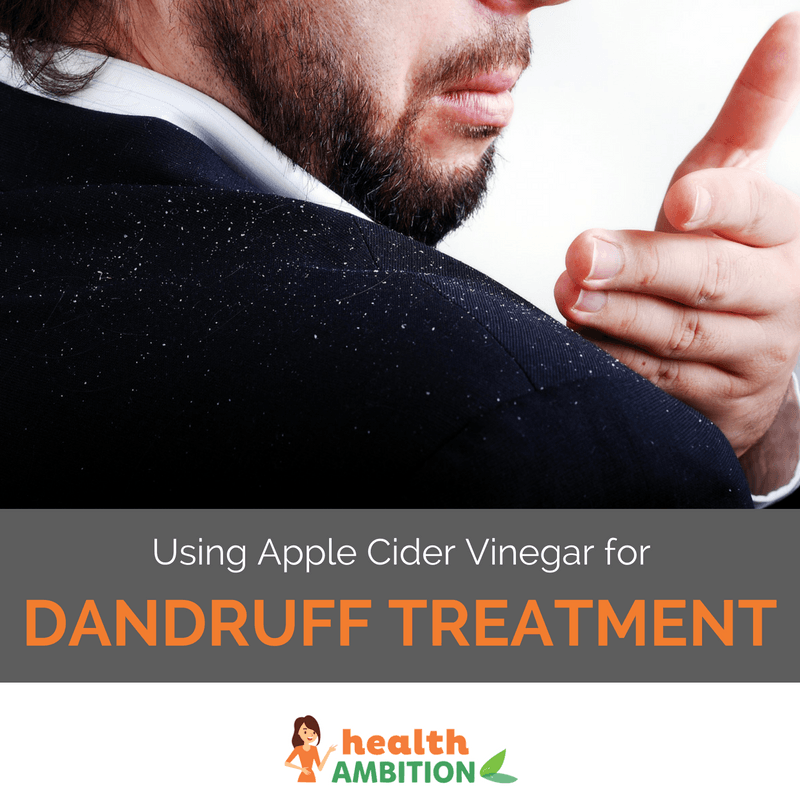 You can experiment with the many ways ACV can be used to treat dandruff to find the right remedy for yourself, and can quickly learn that apple cider vinegar works as well or better than the chemical methods they are used to. Cheap, easily accessible, and safe to use on the body, apple cider vinegar continues to be a health staple for many people, both internally and externally. What is the Best Organic Dandruff Shampoo in 2019? IT WORKS!!! I mixed it with apple scent shampoo and now I my present dandruff is gone i will keep using it until my full dandruff is gone! This stuff works a treat! I purchased double-strength (8%) organic ACV and – for the very first time yesterday – I stood in the bath/shower and poured liberal amounts into my hair, making sure that my scalp was treated. I let it sit for two hours and noticed a lot of skin trapped within my hair. Not long before I washed it all out, I submerged my plastic scalp-massaging brush in ACV and *gently* ran it over my scalp several times to ensure a proper application of vinegar. After washing it all out, I then used dabs of tea-tree into my palm and ran it through my hair. Ordinarily, I flake a lot and have done so for years – It was constantly in my bed, on my computer keyboard, on the bathroom counter and no doubt lying around the house. It’s been especially embarrassing with dark clothing. Yet today, my hair looks great with not one skerrick of flaky skin to be seen. There is no guarantee that it will work as quickly with you as it has for me but I am both stoked and annoyed with such a cheap and effective method but not having sought it out sooner. I will continue this treatment for about another week, alternating the days I use it so that I do not weaken my hair too much. After that, I will do a maintenance wash probably every few weeks. Please note that your diet can be excellent and your personal hygiene really good but it doesn’t make much of a difference with dandruff. I hate putting a chemical cocktail onto or into my body to treat symptoms… This remedy seems to have dealt with the actual source of the problem, most likely an overgrowth of bacteria/fungi that evidently doesn’t stand much of a chance against ACV and tea tree oil. what about now? are you free of dandruff? For the first few weeks of using ACV, my dandruff virtually disappeared and I was absolutely convinced of it being a curative for my flaky scalp. And I still am. I work in close quarters with a lot of people and found that, despite repeated cleaning and rinses, my hair would smell like it came out of a pickle jar for a few days afterwards. If I started to work up a sweat, then the odour became quite noticeable (at least it was for me). So, it definitely works but perhaps I need to dilute it somewhat. In that instance, I worry that it wouldn’t be as effective. I do manage it better now with good scalp massages and more sunlight. If it does get stupid again, then I know that I can always depend on the mild acid to clear it up again. It is hugely important to wash your sheets (especially pillowcases!) at least weekly when combating dandruff or seborrheic dermatitis. If you don’t then you’re subjecting yourself to a certainty of reinfecting yourself from the dandruff flakes and dead skin cells (bacteria/fungi) on your pillows. It wouldn’t hurt to run the vacuum wand lightly over your pillows in the interim. Unintentionally reinfecting yourself over and over will defeat even the best of homeopathic remedies. Thank you, so much for the vingar treatment. It really works for me and my daugther, who has really bad dandruff in her hair. Because she also has very dry scalp as well. What can we do about her dry scalp. Is their anyway to restore the naturals oils to her hair. Thanks again. This was one of the worst dandruff treatments I have ever done! I found it to make it worse then to actually help my scalp. Ever since I tried this I have been using lemon juice. I use 1 part lemon juice and 2 part water. Using the lemon juice has been amazing and I will never use anything else.